Thanksgiving break: turkey, family, pumpkin pie, and football. Those were the things that I came to associate with Thanksgiving, and they appeared to be pretty accurate. Over the last couple of days, I celebrated a rather untraditional Thanksgiving break. It was inspiring and new – it was my first Thanksgiving break of my life, and the best one for that too. Wednesday was our first day off – and this also happened to be my 21st birthday. Myself and some of the exchange students who stayed in DC went to visit Annapolis, the capital of Maryland. 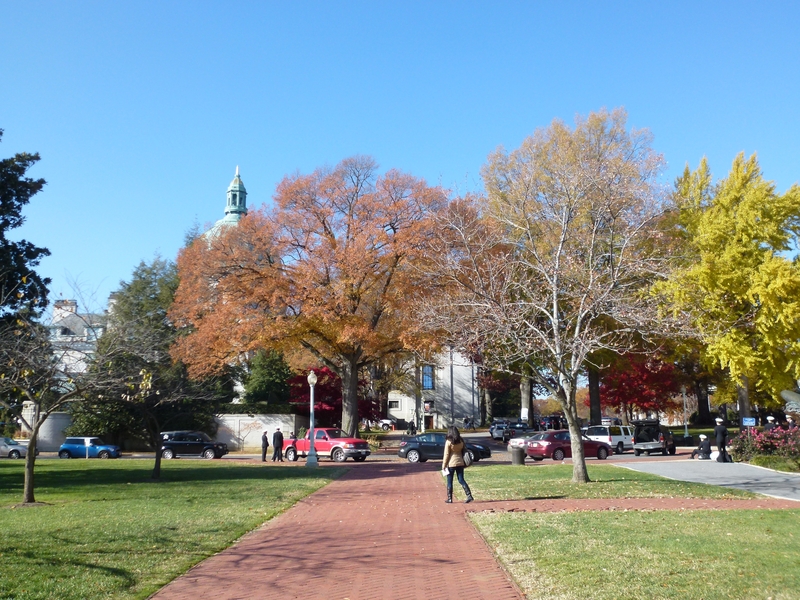 An extremely pretty town, with a lot of colonial history (and corresponding landscape architecture), and host to the United States Naval Academy. This was very interesting, and with a healthy dose of American propaganda in our minds, we left this picturesque place after a full day of sightseeing. The real fun, more closely related to Thanksgiving, started on Thursday afternoon. For the occasion, two friends and myself were invited to spend Thanksgiving with an American family. I cannot express the gratitude and the admiration I have for this family: they invited us into our home and made us feel like we were part of the family, if only for one day. One thing I have not really written about on this blog, is how homesick I get sometimes, wishing nothing less than to go home. Luckily these moments pass very quickly, but nevertheless, the family experience on Thursday reminded me of home and how important family is. The food they had prepared is indescribable: amongst other things there was turkey, ham, duck (impressively prepared by the sixteen-year old son), roasted sweet potato, Brussels sprouts, stuffing, cranberry sauce, a wonderful salad, home-made bread, cheese, wine, and as a special finale two magnificent pies for desert. Now, we were only with 7 people in total, so one can imagine how long we sat at the table trying to devour as much of this delicious food as we could. I truly needed the next Friday to mend, and I am not sure my body has entirely recovered even by today. More important than the great food, we had the most wonderful time, getting to know each other and sharing our different backgrounds. I encountered another very interesting experience on Friday, something which I am fairly sure does not correspond with Thanksgiving traditions, but deserves a mention nonetheless. Via some friends, I found myself going to a sauna event organized by some people working for the Finnish embassy. The Finnish, as some might know, take a lot of pride in their saunas, and I found out this is completely justified. It was interesting to see how soon one feels comfortable in the direct approximation of a bunch of naked strangers, and how relaxing it can be to find yourself in temperatures higher than 175 degrees. The rest of the weekend I used to catch up on work and digest all the new impressions and experiences from the last couple of days. This week was amazing, and Thanksgiving comes dangerously close to my top-3 favorite holiday traditions. Over the last couple of months, there have been several eventful moments in which I found myself completely intoxicated. The first association people will have is alcohol, but it’s surprising how many other things can cause this (usually unfortunate) state of mind and body. The thing that happens to me on the most regular basis is food. One of the many peculiar habits Americans have, is to create enormous portions of food. Whenever I am eating out, the portions that are served are so big it’s physically impossible for me to finish them. Even when you order a pizza here, you better make sure you’re with at least one other person, (although three is more optimal) simply because it is too big. In addition to that, American food tends to be very sweet – it is imperative to check food labels routinely when doing grocery shopping, just to make sure there was not too much sugar added to the product. Even the most savoury food items one can think of will have sugar added, like soup. The second thing on my list landed this spot because of the past week. It is not something particularly American, but something that many people run into now and then. This past week I had four paper deadlines coming up, which meant I spent two nights in the library, working until 4 am, and getting up in the morning at 9 am. Consequently, I was basically a walking zombie for four days, which was not very conducive to my writing and logical thinking skills. This is where the intoxication-part steps in: I lived off of coffee the entire week. I would not advise anyone to do this more often than strictly necessary, but it worked perfectly for me, because I had a very productive week and finished everything in time. The third intoxicating substance on my list is alcohol. No comments there. The fourth and final thing on my list is a more positive sort of intoxication. 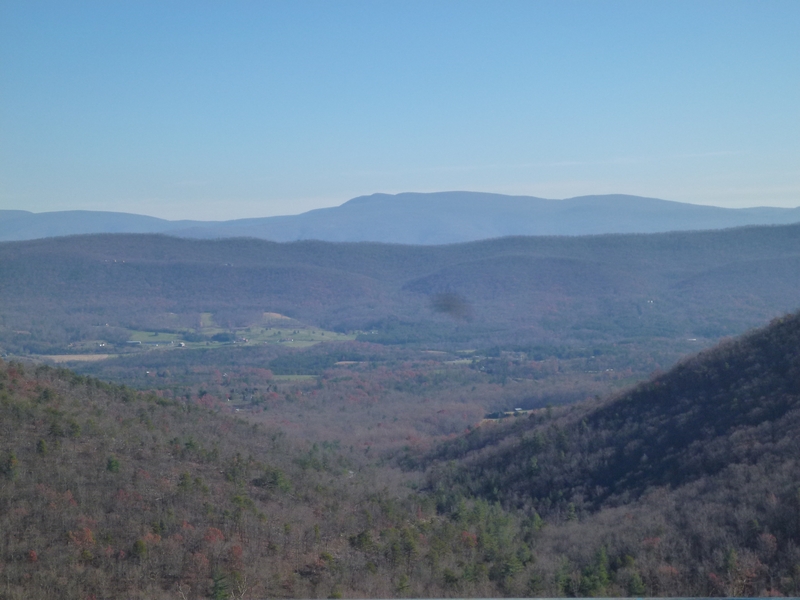 This weekend I joined the GW International Affairs Society on their fall retreat to Shenandoah meadows – essentially the middle of nowhere. No phone reception and no internet, something that almost never happens in the Netherlands (I presume because we have a much smaller territory to cover – slightly less than twice the size of New Jersey). It was refreshing to be away from the city for a couple of days, and the surroundings there were gorgeous. Intoxication by the beauty of my surroundings is my favorite kind, just because it makes you happy and quiet and thoughtful. Four years ago today, I was in high school, not knowing what my future beheld, closely following the American election. Later, when Obama was elected, I remember the developments surrounding Obamacare, and the Thanksgiving cliff-hanger that went with it. In those four years, the United States went through an enormous process of change. Of course, these four years have not been idyllic: the economic recession has had (and still has) major impacts on people’s lives, and partisan differences in Congress diminished the reach of the Obama Administration in many of its plans. Nevertheless, policies promising change have definitely been delivered. The ‘don’t ask don’t tell’ policy was eliminated, women’s rights and LGBT rights were further endorsed, a more universal health care system was passed, the war in Iraq was ended, Osama bin Laden was killed, taxes were made more progressive and the US combat forces in Afghanistan are on their way out. Today, I am in university, studying in the city where it all happens. I canvassed for the President, followed debates closely, openly endorsed the administration and its policies, and am celebrating, still, after Tuesday’s victory. Together with the GW College Democrats, we watched how election results came in slowly, with CNN making the suspense more tolerable. It is impossible to describe the energy and excitement that was buzzing through this room the entire evening. Everybody was fired up, and, as soon as it became clear Obama had won Ohio, essentially securing his victory, ready to go to the White House. The mob of students that took to the streets was enormous. D.C. was buzzing, people climbed in trees on the White House lawn, secret service police had to guard the fence, the national anthem was sung loudly, American flags waved everywhere, people were shouting ‘FOUR MORE YEARS’, some were crying, others were blatantly drunk, and amidst of this chaos I was there. I was there, and I was happy as can be, because I knew that somehow, I had contributed, if only a little, by campaigning for the President, by openly endorsing him, and by talking to people who were not yet entirely convinced. Obama Victory Reaction – GWU Democrats Nov. 6th 2012. Credits go to Olivia Lewis. Obama Victory Celebrations outside the White House Nov. 6 2012. Credits go to Olivia Lewis. “I believe we can keep the promise of our founders. The idea that if you’re willing to work hard, it doesn’t matter who you are or where you come from or what you look like or where you love. It doesn’t matter whether you’re black or white or Hispanic or Asian or Native American or young or old or rich or poor, able, disabled, gay or straight, you can make it here in America if you’re willing to try. I would like to begin this week’s entry with a very important announcement: all is well at Foggy Bottom and in DC. We have been extremely lucky, because Sandy’s worst has never even reached the city. The only way we were affected was the cancellation of two days’ classes and the run on water and canned food in the stores here on campus. We currently have quite a stock of canned food and tanks of water, and were prepared with batteries and lights so that we would have been able to live without running water and electricity for a couple of days. All in vain however, because nothing broke down, and by Thursday morning everything had returned back to normal. My thoughts go out to those who lost their lives, and their families, and to all of those who were adversely affected by this disaster. Seeing that everything was well here in DC, the trip that my friend from Richmond, Danielle, and me had planned for this weekend could proceed, and she visited me here at GW. One of the things I love doing here in DC is switching between being a resident and being a tourist. 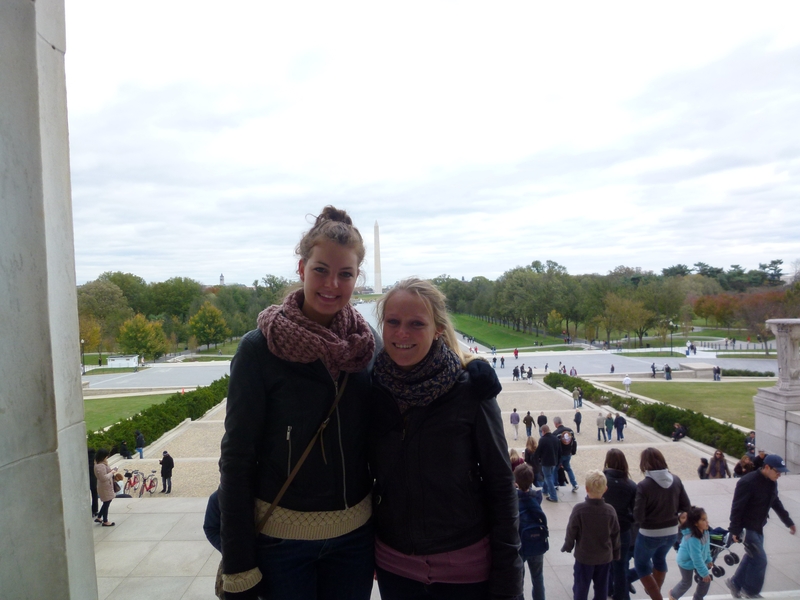 We spent all Saturday biking around DC, sightseeing and visiting all the important landmarks of the city. The balance of that day: we saw the White House, Capitol, war monuments, Lincoln memorial, Washington monument, Jefferson and FDR memorial, Eastern market area, Georgetown, and even managed to squeeze in a visit to Dupont circle. My favorite: the Lincoln memorial. We were exhausted by the end of the day and settled for staying in during the evening, admittedly also because the prospects of going out for under-twenty-one-girls in DC are meager. It was lovely to bike around and see everything, and I was quite impressed with how easy it was to do everything that we wanted to in just one day. In August, when my parents and brother were here, we had three days to see the city, but we never managed to see all of the things in those three days that Danielle and I saw in this one day. I blame this on the heat, and on our scarce knowledge of the city at the time (although my family and I did visit a museum, something I didn’t do with Danielle). Sometimes I wish they could come back so that I could show them everything here, from campus to the Smithsonian institutions, to all the memorials, to downtown. It is really pleasant to act as the tourist guide and take pride in a city that I didn’t even know less than a year ago. Having said that, time is ticking, and I have only seen two out of all the Smithsonian institutions (really cool, free museums) here, so I need to hurry up. Last week, the residential staff of my building organized a trip to the Newseum, not one of those institutions, but nevertheless the best museum I have been to in a very long time. It had huge exhibits on the FBI, the presidential campaigns, 9/11, amongst others, and showed an exhibit displaying actual sections of the Berlin Wall. It was also possible to be a reporter, reading news about Congress against the background of the U.S. Capitol. 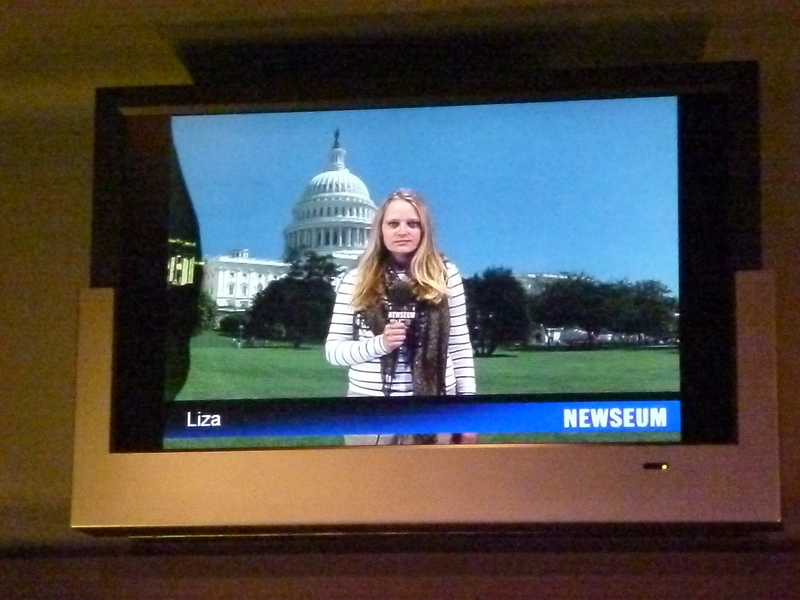 Of course I took that chance and also peeked into the official ABC studios that are housed by the Newseum. It was a great day well spent. Like I said before, time is ticking, and the semester is already past its halfway-mark. Sometimes it is depressing to think how fast time goes (cliché but true: time flies when you’re having fun), and how much stuff there still is left to do. Inevitably, I am going to have to prioritize and settle for less, but there are still some weekends left, in addition to the time I can use after the GW semester ends. Hopefully the time that remains will give me enough opportunity to see more of this beautiful city and country.